Super easy to clean a ceiling fan!!! 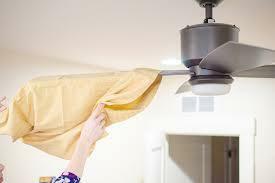 Tired of having to reclean your house after dusting your fan try this super easy trick. When dust sits around, dust mites move in. They contribute to sinus infections and allergies. A dusty fan can send mites scattering to the furniture and bedding, this is actually a health risk. Eeeeewwww!!! !